Apply for your membership below and take the first step to joining our exclusive Members group. Black level membership is open to everybody by filling out the form below. Our Black level members will be invited to upgrade their membership when they reach the required loyalty level. There are no fees or hidden costs for membership, just fill out your application and you can pick up your card on your next visit. I agree to and understand the T&Cs as stated. 2. Members may request copies of their personal information held by the venue at anytime. ​3. 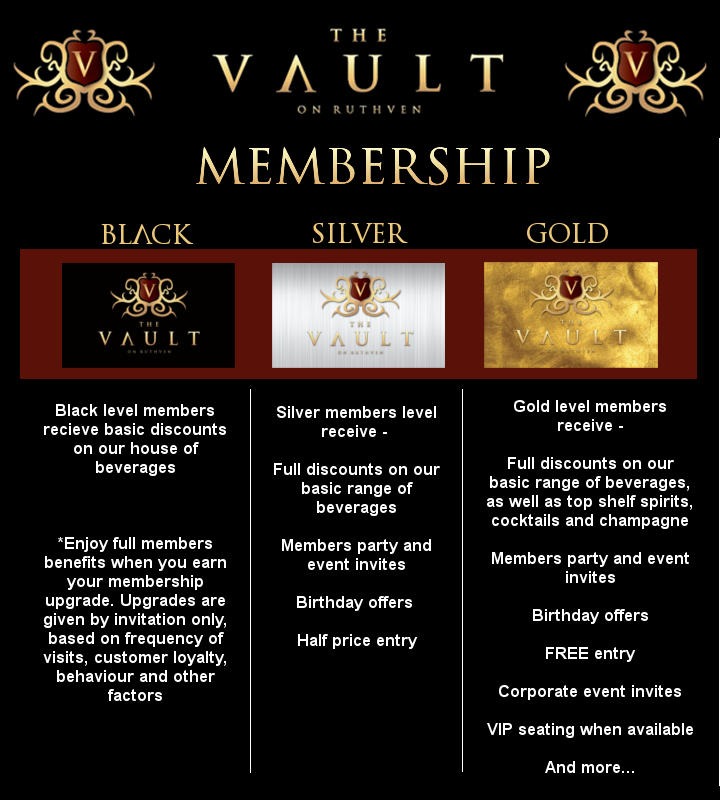 By completing the application form you agree to allow The Vault on Ruthven to use you contact details for delivery of any venue promotions or membership correspondence. 4. Membership discounts do not apply to other promotions in the venue. 5. To make sure you get your upgrade invite as soon as possible be sure to use your card for every purchase. 6. Your membership discounts are awarded for your customer loyalty and as such, if other people are found to be using your discount card your membership may be revoked. 7. Management may change Terms and Conditions at anytime.